What are blood moons? Do they coincide with periods of monumental change affecting both Israel and the world. Could the blood moons signal the end of the world as we know it? Suprisingly, the phrase "blood moons" does not appear at all in the KJV Bible. The three places in Scripture where our closes celestial neighbor turns into the color red is Joel 2:31, Acts 2:20 (which quotes Joel) and Revelation 6:12. We need to cover a few brief definitions as we start our study. These special appearances of the moon are referred to as the blood moon tetrad. A tetrad is a series of four consecutive total eclipses of the lunar surface. Tetrads are relatively rare occurrences. While none occurred from 1582 to 1908 A.D., seventeen total have and will take place from 1909 to 2156 A.D.
A lunar eclipse is the obscuring of the moon's light (which is a reflection of the sun's rays hitting it) due to the earth passing between it and the sun. A solar eclipse, on the other hand, is the obscuring of the sun's light due to the moon passing between it and the earth. Would-be prophets have placed a significant amount of emphasis on the belief that each of the four lunar eclipses in the tetrad, which 'should' produce blood moons, always fall within God's annual Feast Days. Is this true? What does Bible say about blood? What does red symbolize in Scripture? The first total lunar eclipse of a year 2014 - 2015 tetrad did indeed occur within one of God's Feast Days. It fell from 7:06 to 8:24 UTC (Universal Time Coordinated) on April 15th, the first day of the Feast of Unleavened Bread. The second total eclipse, according to NASA, began at 10:25 UTC (6:25 a.m. EDT) and ended at 11:24 UTC (7:24 a.m. EDT) on October 8, 2014. It occured almost twelve hours before the official beginning of God's annual Holy Day period known as the Feast of Tabernacles, which began at sunset on the same day! All Biblical days begin and end at sunset. Anyone who states all four eclipses in the tetrad that produce the blood moons occurred within God's annual Holy Days do not know what they are talking about! 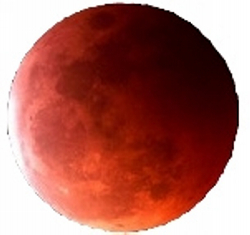 The third lunar eclipse that took place on April 4, 2015 placed it within God's annual Spring Holy Days. The last eclipse in the series happened on September 28, 2015, placing it also just within the Fall Holy Day Season. What makes it look red? When the sun's rays are blocked from striking the moon, as during an eclipse, the lunar surface reflects whatever colors the earth's shadow (creating by the planet's atmosphere) contains as it goes across the desolate landscape. If our atmosphere contains particles of ash and dust from a volcano, the shadow cast will likely look vivid red like blood. If the atmosphere contains many clouds, however, the surface will look darker. The discovery of the moon tetrad and the false belief all the eclipses occur during God's Holy Days has proven a boon to prophecy-based ministries and prophecy-interested outreaches. They can make quite a bit on "blood money" spreading their prophetic nonsense! One prophetic commentator trumpets his belief the tetrad occurs during the Holy Days and rhetorically asks what it all means. His answer is to warn people to wake up and heed what he labels the "ominous" signs from heaven. A World Net Daily article on whether Jesus will return in 2015 quotes Pastor Mark Blitz as suggesting the string of lunar and solar eclipses to fall on God’s annual Feast days, and the appearance of a blood moon, could herald the second coming of Jesus. Pastor John Hagee argues that prophecy points toward the earth reeling toward its last days. In the book "Earth’s Final Moments," he claims to unveil how the prophetic writings of Scripture intersect with current events to reveal our world's last moments. One would expect the Blood Moons to be visible by everyone, especially if they are to be a sign from God almighty that the world will finally be ending! If the tetrad cannot be seen worldwide, surely it would be viewable in Jerusalem given its pivotal role in end time prophecy! According to NASA, the April 15, 2014 eclipse was NOT visible at all in Jerusalem, or the Middle East, or most of Europe, or even central Asia. The eclipse that took place on October 8, 2014 and the blood moon of April 4, 2015 was also not visible in Jerusalem, Africa or Europe! Even on September 28, 2015, which was touted as Jerusalem's last chance to be warned of its impending doom, only part of the eclipse was seen from the city. One must ask whether a sign that few people notice is much of a sign. An Old Testament prophet wrote of the day of the Lord as being a day of thick darkness (Joel 2:1 - 2, 10). This description was repeated by Jesus himself (Matthew 24:29). Joel added the moon will be turned to blood, with John referring to the same appearance and adding the sun will look black (Revelation 6:12). The eclipses in the 2014 - 2015 Tetrad all lasted less than two hours. The darkness that fell over Egypt as punishment for not releasing the children of Israel from slavery lasted for three days (Exodus 10:21 - 22). The day of the Lord, however, when God miraculously causes the moon to appear as blood, will last approximately eighteen months! This Biblical sign of the end of man's rule on earth will be so spectacular that it will be undeniable (Revelation 19). Should Christians keep New Moons?